Offerpop, a leading social marketing software company, has released “The Definitive Guide to Hashtag Campaigns,” a free eBook that outlines how to launch hashtag campaigns that combine the reach of traditional media with the virality of social media. 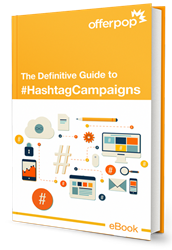 The 10-page eBook explains how marketers and brands can unlock the power of the exploding popularity of hashtags. Packed with tips on choosing a hashtag, using hashtags to gather user-generated content, and inserting the hashtag into all marketing efforts, the eBook focuses on practical steps marketers can take to effectively wring the most marketing value out of hashtag campaigns. Hashtags first rose to popularity in 2007 on social media network Twitter, but have since become an integral part of almost all social sites, including Facebook, Instagram, Vine, Tumblr and Google+. The wide acceptance of the hashtag gives marketers the opportunity to launch campaigns that reach social media users on all social media platforms. Marketers can also use the hashtag as a call to action, encouraging potential customers to engage on social media by inserting the hashtag into advertising, billboards or posters. Offerpop’s eBook is one part of the New York-based social marketing software company’s effort to highlight the ongoing innovation in social marketing. The company recently released Hashtag Gallery, a social marketing product that uses hashtags to launch campaigns across social networks, and allows marketers to compile and manage user-generated content at scale. Offerpop helps marketers launch powerful social marketing campaigns to reach, engage and connect with their consumers. Global brands, agencies and small businesses use Offerpop to increase revenue and grow fans, followers and email subscribers. Launch campaigns across any marketing channel — website, advertising, email, and TV — and drive engagement on Facebook, Twitter, Instagram and Pinterest. Offerpop is a Facebook Preferred Marketing Developer, qualified by the PMD program in Apps. Offerpop is a Twitter Certified Product. Learn more at http://www.offerpop.com.